Let’s make one thing clear: Table 19 is not a terrible film. It’s by no means a masterpiece, and it certainly has one or two problems, but is it really 19% on Rotten Tomatoes bad? No it isn’t, and I honestly don’t fully understand why critics are giving this movie such a hard time, even causing it to be something of a box office disappointment in the States. Don’t get me wrong, there are times when I do get why somebody wouldn’t like this film, but I personally found it to be an interesting, even captivating, character piece that makes the most out of its strong ensemble and simplistic premise, enough to make it a likable comedy-drama with some touching depth to it. We start with a woman named Eloise (Anna Kendrick) reluctantly attending the wedding of her oldest friend, for which she was stripped of her maid of honour title after she was dumped by the best man, Teddy (Wyatt Russell). At the reception, she is placed at table 19, which is reserved for courtesy invites or people that weren’t expected to show up at all; there, she meets people like Jerry and Bina Kepp (Craig Robinson and Lisa Kudrow), a couple with passive aggressive tendencies; elderly retired nanny Jo (June Squibb); sexually-frustrated teen Renzo (Tony Revolori); and socially-awkward ex-convict Walter (Stephen Merchant). As the reception drones on and more revelations around the table come to light, the outcasts all start to form a tight bond with one another. Kendrick is billed as the lead, but this is very much an ensemble piece; all the actors, including Kendrick, are given a fair share of drama and humanity to make their characters interesting and more layered than other wedding comedies of this type. Characters that would normally be one-note like Russell’s jerky ex-boyfriend or a handsome stranger that Kendrick’s character becomes attached to, are given real depth and complexity to them that make them more than just the simple archetype we’re used to seeing in films like this, and the performances are so perfectly grounded that they really show you the raw and vulnerable emotion that they’re going through. On top of that, the actors have great chemistry with each other, particularly Robinson and Kudrow who argue in the way that only long-lasting couples would argue, and they’re interesting enough to make you really invested in their lives and what they do throughout the course of the film. The way that writer-director Jeffrey Blitz also works with standard wedding movie clichés is also commendable; of course, as is prone in a film like this, the wedding cake becomes involved somehow, but it’s done so naturally and without a hint of awkwardness that it’s a rather refreshing spin on that old trope, and it comes at a time when it’s not only truly unexpected but also feels right in the moment. It also uses a few rom-com tropes near the end, but again it’s all done with a genuine heart to it and doesn’t feel that cynical or clichéd even when it does happen; by that point, you’re really rooting for these people to get what they deserve and have it happen before at least the end credits pop up. The film does have a good amount of laughs throughout, mainly coming from the actors’ wit and comedic timing, and the dramatic moments don’t feel too forced or out of place. However, a few of the jokes don’t always land, and some bombshells don’t quite make the impact that they’re hoping; is that why it received such dismal reviews, because a lot of critics didn’t find it all that funny, or dramatically engaging in places? I honestly have no idea, because while everyone is entitled to their opinion I cannot understand for the life of me why Table 19 has received such disdain from critics. Is it a fantastic film? No, but it’s nowhere near godawful, either. 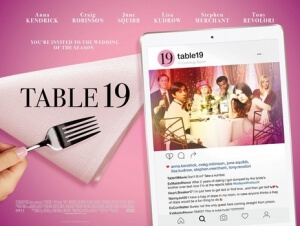 It’s a good movie with a great heart, a fantastic ensemble, a strong script, and more to offer than your average wedding rom-com – whether you like it or not is down to you and you only, but just know that whatever you’ve heard about Table 19 thus far, it’s really not as bad as people are saying.